Last week, Facebook officially unveiled its new amplified ‘Like’ button and while it was big news to the public, the social media giant had been testing their new powered-up emojis in Ireland and Spain before launching them globally. Now, Facebook users can add emotion to their ‘Likes’ which provides brands and the advertising and marketing community with additional data points to help shape future content and campaign results thanks to the enhanced reporting Facebook will provide to marketers. It’s clear that Facebook’s ability to continually innovate by assessing what both consumers and marketers need, and then acting upon those needs, has helped them drive relevance to continually raise the bar. As with all things in the marketing space, we are continually seeking ways to measure effectiveness and we are very excited about the opportunity to benefit from Facebook’s new feed ranking algorithm that will now count reactions as likes. This will enable an additional data point which will help us evaluate the performance of our social media posts, and offer an additional way to evaluate ads. 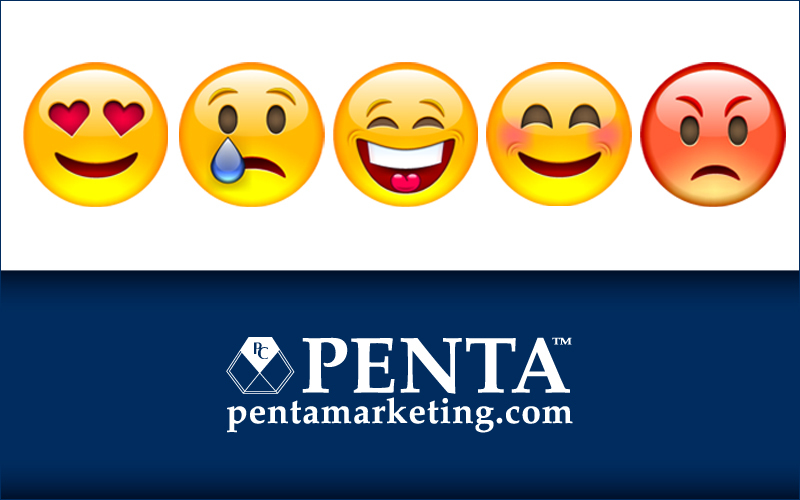 The new emojis convey reactions and include Like, Love, Sad, Angry, Wow, and Haha. To use them, all you need to do is simply hold down the ‘Like’ button, see the reaction and tap which you’d like to use. As with most enhancements, the reactions emerged after Facebook conducted extensive research on people’s feedback and comments, and organized numerous focus groups to learn what type of reactions people would want to use in addition to the ‘Like’ button. Facebook then developed a core set of reactions taking into consideration the most universal expressions from their research. The new reactions offer significance for brands. Hours after Facebook announced their release globally, several major brands showcased the incorporation of the enhanced emojis in their ads including KitKat, Red Robin, Snickers, KrispyKreme, the Atlanta Braves, Samsung, and Chevrolet. Each playfully integrated the new emojis to illicit emotion for their products which beautifully leveraged the moment. For brands, the new reactions provide a more accurate method of assessment in the measurement of feedback. We are excited that for those client social media campaigns that we manage, that we will now have an opportunity to see reaction counts within Facebook’s page insights tool. This offers greater insight into how a client’s customer is feeling about a particular post, providing a more automatic measurement of the response, helping to shape and tweak our social media content to ensure it’s more in alignment with the needs and desires of those customers in real time moving all campaigns to a higher level of success. The new emojis also make it much easier for a consumer to react without having to take the time to write a comment on a post. This saves time for the consumer, and it streamlines data sorting for our social media team with less potential commentary to sift through and analyze. While it doesn’t negate the value of commentary, it provides an easier method of data collection. We believe that commentary is important in helping marketers keep abreast of how audiences react to a post, and very often, providing deeper insight into the strengths of products or services, and in some cases, calling attention to a problem that needs to be addressed. Thoughtfully interpreting the data and using it to improve strategy is only one benefit of the new reactions. It really gives us an opportunity to analyze on a new level and we look forward to seeing how this evolves. One of the most exciting attributes of our industry is that it continues to evolve and change, providing a consistent stream of revolutionary innovation that inevitably benefits how we market products and services with results.